I recently discharged a lady of about fifty - to return in two months for maintenance care - when I found her two weeks later back in my appointment book, and with a very painful behind. Getting out of the bath, her foot slipped on the wet floor and she fell heavily on the edge of the bath. It took some weeks for her to get over the injury to her coccyx following the usual chiropractic protocol, but really it was all so unnecessary. An injury that should never have happened. So what are the requirements for a safe bathroom? or really, just some little tinies if you are more confident. But have something IN the bath. 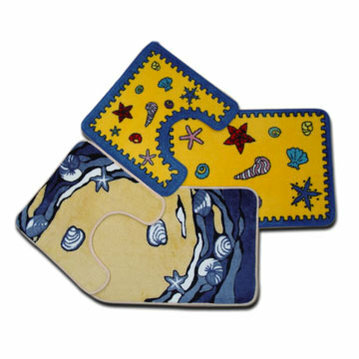 Fun mats for the kids abound. They too of course can slip and fall, with their little short legs. These come in a hundred shapes and sizes, some very functional, others rather pretty, but make sure it has a rubberised back. This bamboo bathroom mat is very pretty, and may fit the decor of your bathroom, but it's a disaster waiting to happen. 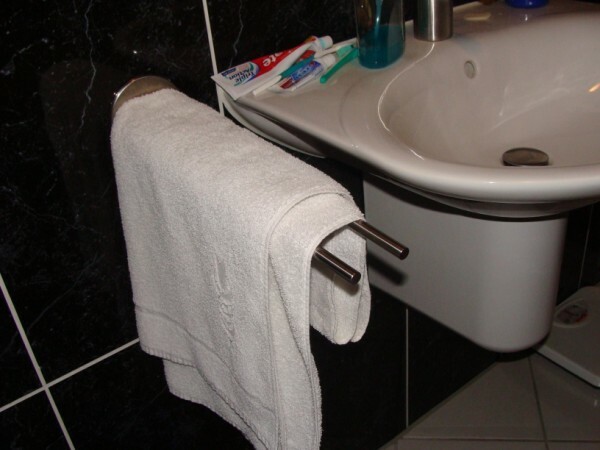 It's probably wisest to assume that somebody, perhaps not you but a guest, or granny, will one day slip in your bathroom. This towel hanger invites hara-kiri! 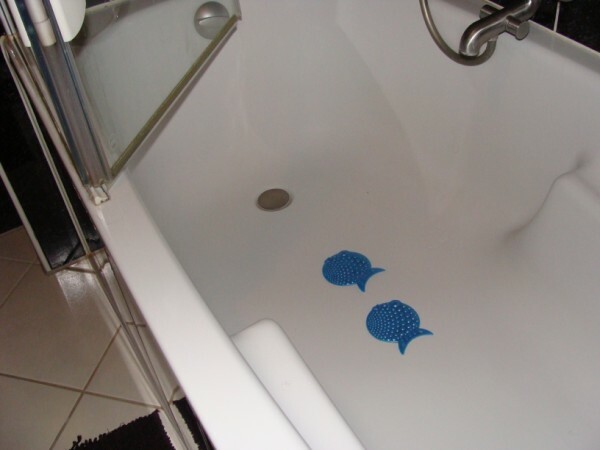 The shower has inummerable benefits over the bath, most of which are self-evident, so I won't bother to enumerate them, save one. Not having to step over the edge of the bath, the single most dangerous part of the bathroom routine is a singular benefit of the shower. But if you have a shower in the bath, and have also to step carefully passed a shower screen, it simply adds to the danger. 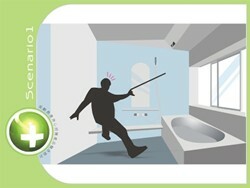 A curtain is perhaps safer, except that some spray onto the floor is inevitable increasing the danger of a slip. Many homes in Europe now only have a shower, to save water and space, and perhaps as a safety feature, but if you are planning a new home and want a bath, please consider keeping the shower separate. 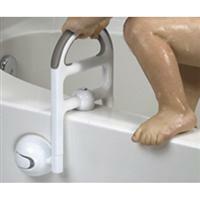 A bathrail is a certainly something to consider, at least for children and the elderly. If it saves one fall, it will have paid for itself many times over. In summary, I hope you will give some consideration to safety in your bathroom. 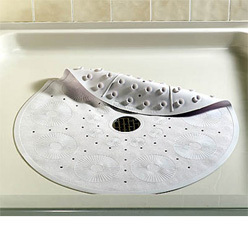 Falls on the tiles, on the edge of the bath and against accessories are generally very painful. 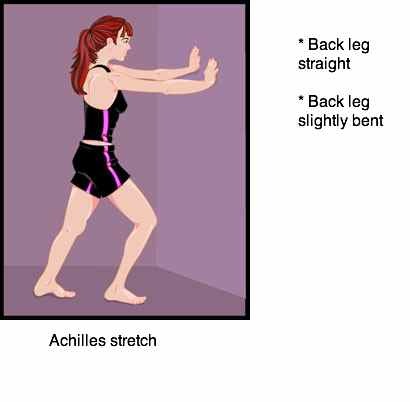 Any number of injuries can happen in a fall in the bathroom, but this little achilles stretch is an alltime favourite. Research shows that people who regularly stretch their achilles tendon have much less foot and ankle pain, not matter what the source of pain. Do it first with the knee straight, and then repeat with the knee slightly bent. Doing a partial dry-off with your face cloth, saves your towel getting drenched and mildewy. Love to read? Want to learn more about Chiropractic in an easy to read setting? Bernard Preston is having a Christmas sale until December 31. Both Chiropractors and their patients love his books. Buy one now, read it first and then give it to your chiropractor! If you can part with it. Win-win. Pasta - if you make it yourself at home - is scrumptious. Personally, I think the bought variety is junk food. But this recipe containing red coloured foods is delic and nutritious. Why red coloured foods? In general the coloured foods like broccoli with its deep greens, and carrots with its yellows, are full of cancer preventing anti-oxidants. There's strong research proving that a tomato a day will reduce the chance of the most prevalent serious cancer in men - of the prostate - by an enormous 50%. Chop up the chillies and garlic and fry gently in a little olive oil. Add the tomatoes and cook gently for for about 20 mins, stirring occasionally. Throw in a few pre-cooked chicken or lamb pieces. Meanwhile, put a pot of salted water on to boil - for the pasta, "al dente". Spread the sauce over the pasta, smother with grated Parmesan cheese and finely chopped parsley. Until next month then. Promise not to fill your Inbox with information overload. Should you have found this email helpful, feel free to forward to family and friends. Yours in Better Health, a Healthy Blessed 2009. This site is not intended to diagnose, treat, cure, or manage any illness. Please consult your chiropractor. The information is to the best of my ability at the time of writing accurate and correct. Queries, comments and corrections are very welcome.